Fiat's sales numbers in Canada and in the U.S. speak for themselves. Consumers went all crazy with the cheeky 500 hatchback when it launched here in 2011, but since then, traffic in Fiat dealerships-er, Fiat Studios-hasn't been fantastic. In fact, sales in Canada have nosedived by 57% in 2016 compared to 2015. That's not good. The 500 hatchback has changed very little since it was launched. The 500L wagon is pretty versatile, but its exterior appearance might not please everyone. The 500X crossover was supposed to be a volume seller, but it's gathering dust on showroom floors. High prices don't help, either. 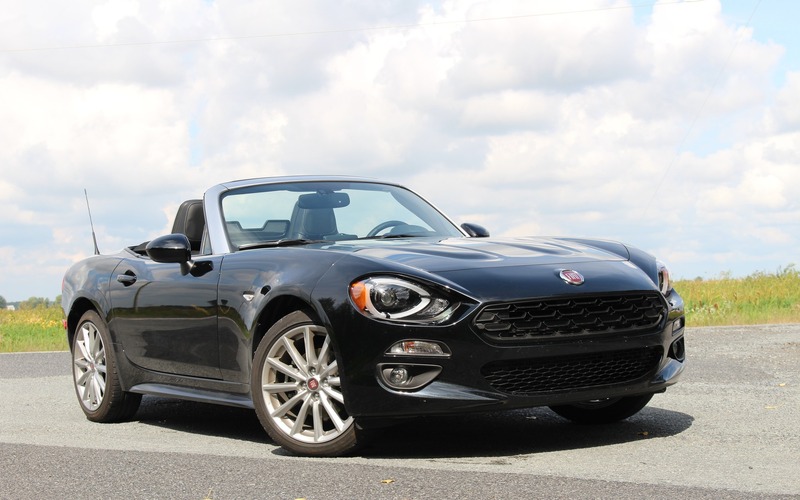 And then there's the 2017 Fiat 124 Spider which hit the streets last summer. It's totally different from anything Fiat has been offering us so far, and it's gorgeous. That's a personal opinion of course. The 124 Spider is a car that can draw people into a showroom and give a brand's other models some extra visibility. However, it isn't the bread-and-butter car Fiat desperately needs. In case you're not aware by now, the 124 Spider is based on the Mazda MX-5's architecture, and is built in Japan alongside its cousin. The cockpit is pure Mazda, although the seats are different. However, the 124 does get a Fiat engine, its own chassis tuning and its own body panels that make the car slightly bigger and heavier. On the outside, the two cars are very different. 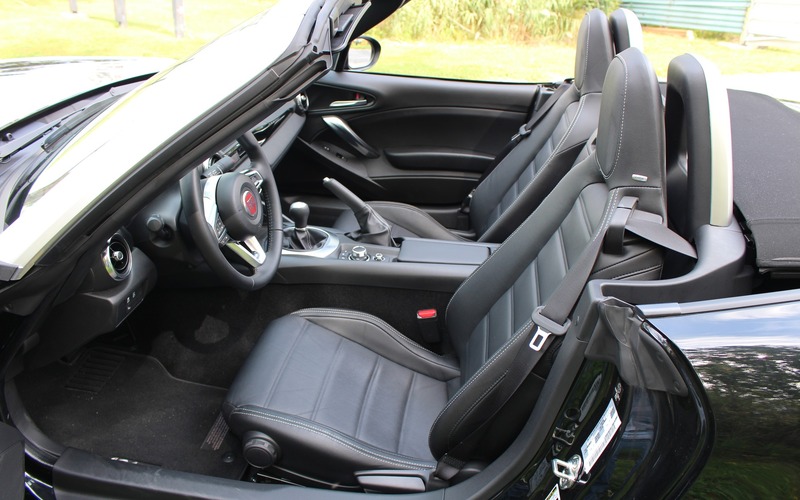 Under the long hood of the 2017 Fiat 124 Spider lies FCA's turbocharged, 1.4-litre four-cylinder engine that develops 160 horsepower-164 for the Abarth version-as well as 184 pound-feet of torque that peaks at 2500 rpm. 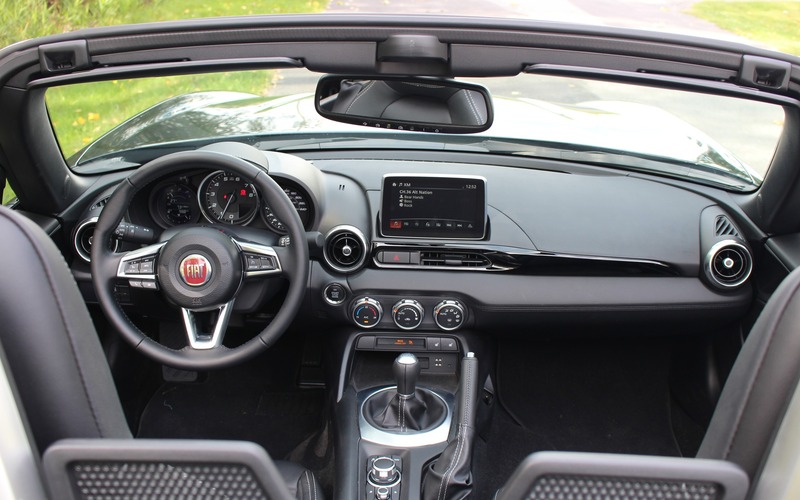 As is the case with the MX-5, Fiat's rear-wheel-drive roadster is extremely fun to drive, and its meatier torque band provides more gusto as the car claws its way up to speed. The Mazda-designed six-speed manual isn't the same one as in the current MX-5, and it's not as slick, but is nonetheless a joy to manipulate. A six-speed automatic is optional. In addition, the Fiat is a tad more fuel efficient, if only by a tenth of a litre per 100 km. Premium unleaded is recommended, but regular fuel is acceptable. With the more expensive stuff, we managed a fuel economy average of 7.4 L/100 km, which is pretty good. The noticeable difference between the two cars can also be felt in the suspension. Fiat preferred giving the 124 Spider a ride that's a little less firm, but more comfortable. 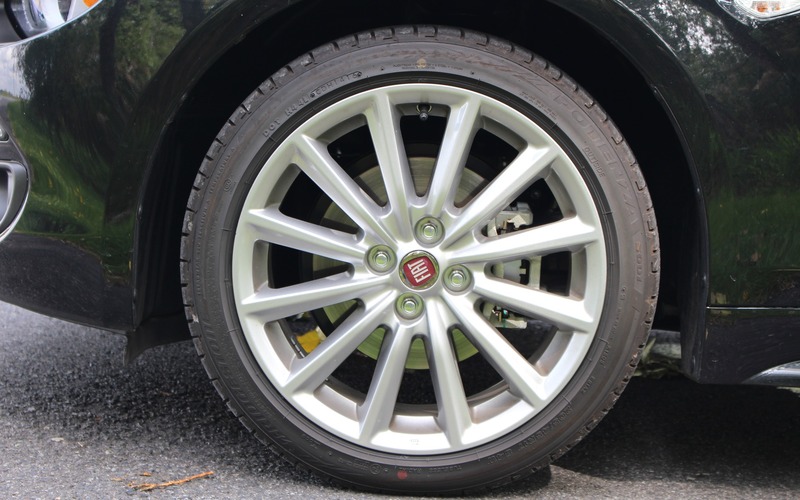 The car might not be as surgically precise in the twisties than the Mazda, but overall, the Fiat should be the better choice as a daily driver. If you've sat in a recent Mazda product, you'll recognize the design and functionality of the Japanese brand in the Fiat. Aside from the logo on the steering wheel as well as the aforementioned seats, which are supportive despite a useless driver-side seat-cushion adjustment knob, it's hard to feel any Italian charm and character here. On the other hand, Mazda is the Japanese brand with the most emotional design philosophy, perhaps the most sensual, and it fits well here. FCA probably could've used their excellent Uconnect infotainment system, but that would've meant redesigning the dashboard. Mazda's system is almost as good, and its console-mounted multifunction knob and volume dial are ergonomically placed. Yes, it's tight in the 124 Spider's cockpit, as it's a small car to begin with, but the only true shortcoming is the snap-in cupholders, which are always in the way. Happily, they can be removed and thrown in the storage compartment between the seats. The fabric top has no power assist, but that's ok; the top isn't heavy and its mechanism is easy to use, so many people will be able to open or close the top with one arm. At a stoplight, it takes about two or three seconds. 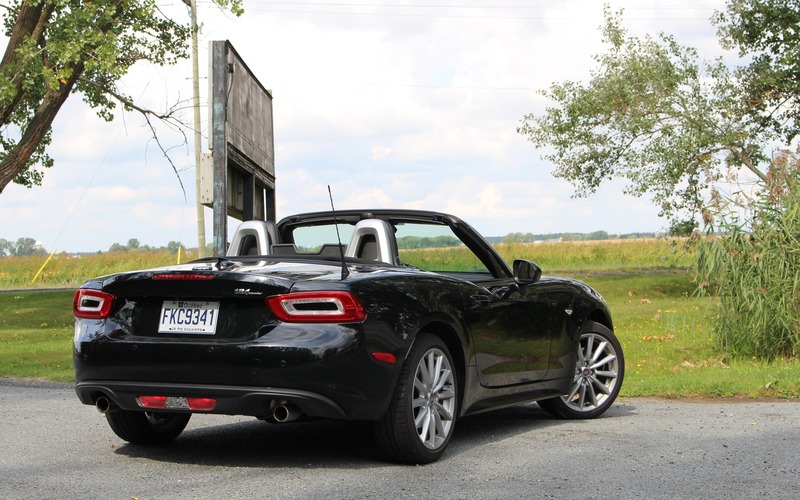 If we keep mentioning the Mazda MX-5 here, it's not only because they share the same bones, but the 2017 Fiat 124 Spider has very few direct competitors. There's the MINI Cabriolet, which starts at $28,490 in base trim with a 134-hp, three-cylinder engine. 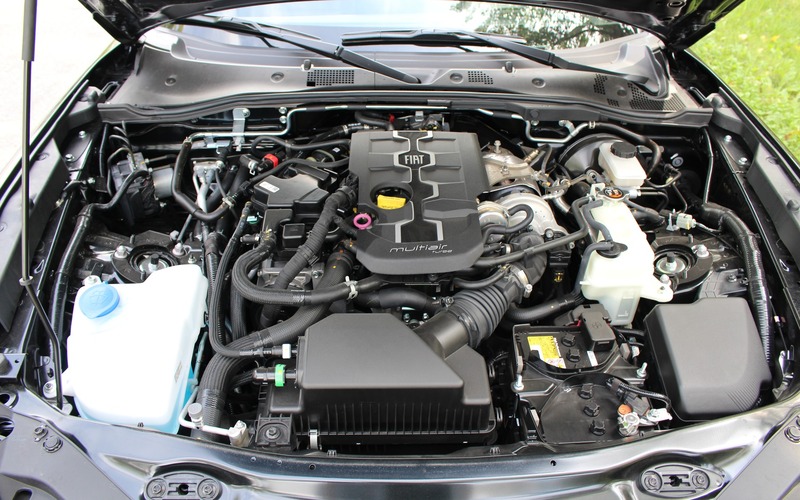 A little further upstream are the Audi A3 and BMW 2 Series, whose convertible versions start at about $45K. The MX-5's price ranges from $32K to $40K. Meanwhile, the 124 Spider is available from $33,495 before freight and delivery charges. That's for the Classico trim with cloth seats and without the touchscreen infotainment system. The loud-and-proud Abarth version, with its sportier appearance and stiffer suspension, goes for $38K. Our well-equipped Lusso with optional blind spot monitoring, navigation and LED headlights checked in at $40,695. 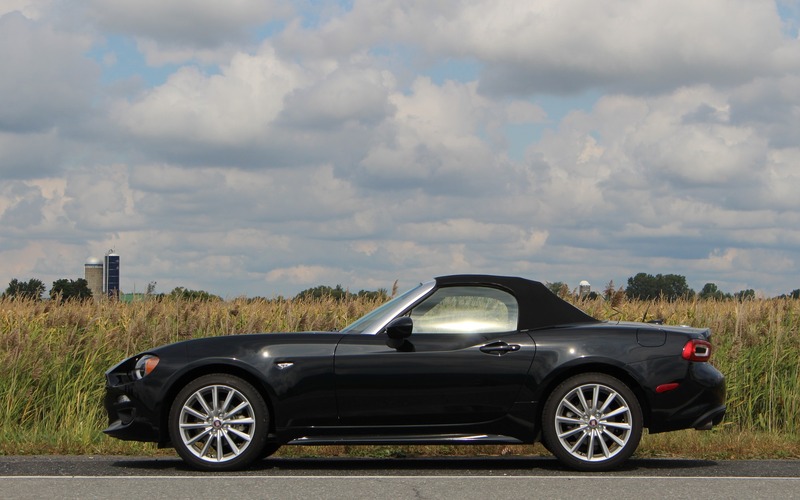 It would be unfair to say that the 124 Spider will attract buyers on looks alone, because it's fun to drive, and although it doesn't feel very Italian, the compromise is Japanese reliability and build quality, which makes a smarter choice than the MINI. And it's without a doubt the most beautiful Fiat model on our market. It might not sell in big numbers, but that exclusivity could be considered a plus. Read more on The Car Guide.